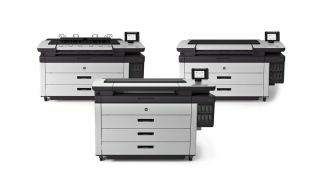 The new PageWide XL 8000, 5000, and 4000 series join HP's printer family for large format prints. HP claims the new models are the "fastest large-format production printers" available in color and black-and-white. The PageWide XL printers can print posters at speeds up to 30 prints per minutes, and HP claims that its printers are up to 60% faster than the fastest monochrome LED printers on the market. HP is targeting print studios, architects, engineers, reproduction houses, and technical teams with these large format printers. The HP PageWide XL 8000 is the largest printer, offering high-end production printing. The 8000 model can print up to 30 D/A1 prints per minute. The ink cartridges for this model can print up to six rolls of paper for high volume jobs. The HP PageWide XL5000 is targeted at small- to medium-sized print houses and can print up to 14 D/A1 prints per minute. Ink will last for up to four rolls of paper. In the entry-level PageWide XL 4000 series, there are two models: the 4500 and 4000 printers. The 4500 printers can handle up to 12 prints per minute while the 4000 can produce eight prints per minute. HP claims the new PageWide XL Pigment Inks are superior to LED prints, providing dark blacks, vivid colors, and are moisture and fade resistant. Based on HP Thermal Inkjet technology, HP says the PageWide XL printers deliver high ink efficiency and long-life printheads when compared with LED printers. There will also be different types of paper available, including Universal Bond Paper, Production Matte, Glass, and Satin Poster Papers for different types of print jobs. The PageWide XL 8000 will be available in September, and HP says that the other PageWide XL printers in the portfolio will become available between November and January of next year. HP did not reveal pricing for the printers.